Maria Cardegna first appears at Painesville, Lake County, Ohio, in 1906. When she immigrated to the United States Painesville, Ohio, was her destination. Maria was ten years old. She immigrated with her mother, Maria Orazia Gentile, and siblings, Felicantonio Cardegna and Giovanni Cardegna. In America, Maria Cardegna was known as Mary Cardina, then after she married, by her married name, Mary Bertone. Maria Cardegna, daughter of Michele Arcangelo Cardegna and Maria Orazia Gentile, was born on May 2, 1896, at Frosolone, Isernia Province, Molise, Italy. 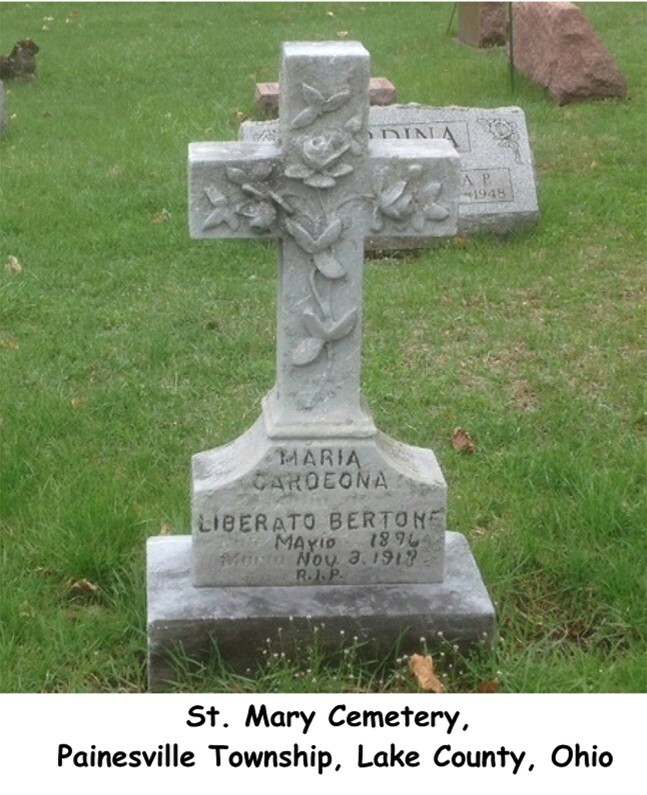 She married Liberato Bertone, son of Nicola Bertone and Maria Giancola, on November 28, 1912 at St. Mary Catholic Church, Painesville, Lake County, Ohio. Liberato Bertone was born at Sant’Angelo in Grotte, Isernia Province, Molise, Italy. Maria died on November 3, 1918, at Lake County Memorial Hospital, Painesville, Lake County, Ohio, at age 22, of the Spanish Influenza. Her body was interred at St. Mary Cemetery at Painesville Township, Lake County, Ohio. When Maria passed away, she left three daughters under age four. Maria Cardegna immigrated to the United States on May 31, 1906, at age 10. She was travelling to Painesville, Lake County, Ohio. Maria’s family was joining the family’s father, Michele Arcangelo Cardegna, in Painesville. The family arrived in the United States at the Port of New York City aboard the ship SS Gera. Maria Cardegna was enumerated for the 1910 Census of the United States, on April 23, 1910, living at Henry Street, Painesville, Lake County, Ohio, as a daughter of Michael Cardina. Her name was recorded as Mary Cardina. 1. 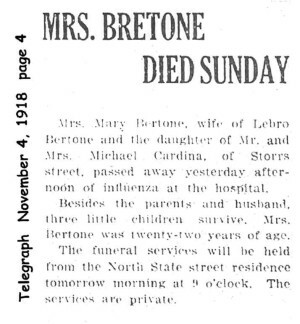 Carmelita M. Bertone was born on January 7, 1914, at Ohio. She married James J. Arp on May 28, 1932 at Painesville, Lake County, Ohio. 2. Grace M. Bertone was born on September 22, 1915, at Painesville, Lake County, Ohio. She married Marshall Carter on December 31, 1936 at Painesville, Lake County, Ohio. Grace died on August 7, 1972, at Painesville, Lake County, Ohio, at age 56. Her body was interred at Riverside Cemetery at Painesville, Lake County, Ohio. 3. Dorothy R. Bertone was born in 1918, at Ohio.